This plant is the granddaddy of all pelargoniums, as it is one of the bulkiest plants in the Pelargonium group. In cultivation at the Karoo Desert NBG in Worcester, some plants attain heights of 1.4 m. In its natural habitat, plants are known to attain heights of 1.2 m.
This plant is a succulent perennial shrublet. 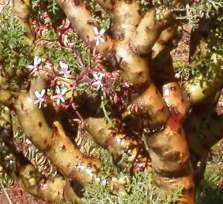 The stems are thick and fleshy with knobs on them, and greenish yellow with peeling bark. Pelargonium crithmifolium is summer deciduous. 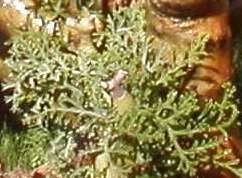 The plant is able to photosynthesise through its greenish bark. This unusual characteristic is seen in a number of other summer deciduous plants from the arid winter rainfall areas. It is nature's way of surviving the dry summer heat. The succulent leaves are usually tightly bunched together on the tips of the branches. They are pinnately divided (divided into smaller leaflets). The leaves, when crushed, have a ginger and nutmeg smell. Flowers are produced in umbels of normally 4 to 8 at a time. Flowering time is anywhere from May to October. The plants generally grow very slowly. This is especially the case where plants are cultivated from seed. Under ideal conditions it can take five years for a plant to reach a height of 1 m. They can live for more than forty years. Pelargonium crithmifolium occurs in southern Namibia, the Richtersveld and Namaqualand. It favours hot, dry, rocky habitats. Like so many of these plants from the dry western parts of our country, they are water misers. They survive in winter rainfall areas that receive little more than 80 mm per annum. They are relatively frost tolerant, being able to survive temperatures of -4 °C. The samphire-leaved pelargonium has leaves which resemble the sea samphire. Crithmum and folium is the Latin for leaf, hence the specfic epithet crithmifolium. Pelargoniums have been cultivated for centuries and Pelargonium crithmifolium was reported in cultivation in England as early as 1792. One has only to look at the window boxes with pelargoniums spilling out of them in a number of European countries to realise the truth of this. It is estimated that there are over two hundred Pelargonium species in South Africa alone. Pelargonium crithmifolium is pollinated by bees and bumble bees. The seeds are carried by the wind some distance away from the parent plant. Once they reach the ground they bore their way into the soil. This is possible due to the corkscrew tail attached to the end of the seed. As the wind blows, so the corkscrew turns, much like a drill bit. This particular species is adapted to surviving in dry conditions. It has thick, succulent stems which are able to photosynthesise and is summer dormant. Its slow growth pattern may also protect it from seasonal fluctuations. Propagation can be accomplished either by cuttings or seed. If one wishes to propagate by cuttings, it is advisable to harvest material in early autumn when the plant is starting to produce its first set of leaves of the season. It is at this stage that the plant is at its most productive. Once the cutting is taken, allow it to dry out for two weeks. 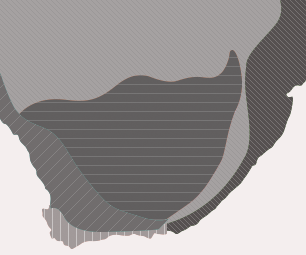 The cutting should be 100-150 mm in length. Ensure the cutting is healthy and has plenty of new growth on it. Use sharp, good quality river sand to strike the cuttings in. One can use low intermittent misters. A misting four times a day in April should suffice. Ensure that the area where the cuttings are placed to root is well ventilated and that there is enough natural light (approx. 50%). Under the right conditions, the cuttings should root within two to three months. Rooting is a lot slower than the other Pelargonium species, due to the caudiciform (thick succulent) growth of the plant. Plant out in one-pint bags. Use sandy loam with very well-rotted compost. Move to a sunny location. By October/November the plants should be strong enough to be planted either in a pot or outside. Seeds are borne in spring (September to October) of each year (southern hemisphere). Collect the seed once ripe. Sow the seed in April/May (autumn), when the growing season commences for this plant. Sow in well-drained loam, approx. 1 cm below the soil surface. Keep moist and well ventilated. Give plenty of light. The seeds will germinate in two to four weeks. The seedlings should be fat and healthy (about 20 mm in diameter). Prick out carefully without damaging the roots and plant into one-pint bags. Move to a sunny location. The seedlings should be ready for planting by the next April (autumn). Powrie, L. 2004. Common names of Karoo plants. Strelitzia 16. National Botanical Institute, Pretoria.